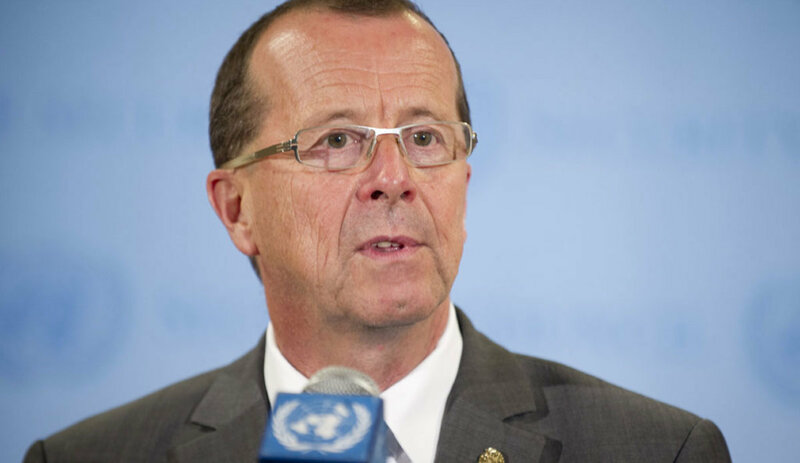 PESHAWAR: German Ambassador to Pakistan Martin Kobler on Sunday asked media persons to highlight the issues relating to climate change, asking why COP-24 didn’t make headlines in Pakistan despite its high vulnerability. Heinrich Boell Stiftung (HBS) is a German Green Foundation operational in the country since the past 25 years non-issues pertaining to ecology, democracy and human rights. The event was organised to acknowledge the contributions of the cohort of Journalists on environment established by HBS in 2015 titled, “Journalists on Climate Change and Resource Equity” in order to mainstream the subject of the environment including climate change and natural resource equity in media reporting. After four years of successful engagement with the journalists, HBS celebrated and formalised this media association. Most recently, reporters carried out field visits in Khanpur, Quetta, Gilgit, Thar coal power project and Hunza partnering with organisations working on environment and sustainability. After community visits and immersive talks, journalists reported on several issues such as the impact of mineral crushing in Khanpur; customary laws and resource equity in GB, and indigenous water conservation methods in Quetta. Kobler further emphasised on the importance of knowledge-based reporting for independent journalism in Pakistan especially when the air we breathe in Pakistan is filled with toxics. Despite the rich natural beauty and rich resources, Pakistan is suffering environmental consequences. He also spoke about the plastic pollution which is increasing in the oceans around the world and encouraged the audience to adopt ecologically just consumption patterns and refuse plastic in their life. It is important to decouple economic growth from carbon emissions. Mome Saleem, head ecology program and convener of the environmental journalists cohort of 90 members, gave an overview of this initiative and added that resource equity in any part of the world can only be achieved if the rights of nature and humans are recognised and secured. She shared how through this cohort environment reporting has increased in the past 4 years. “The cohort is a means to not only connect but to widen the scope of environmental journalism. There is always an economic actor or economic benefit that influences decisions which stress environment. Therefore, it is important for the journalists to highlight this connection for informed and independent policy decision making,” she said. Gregor Enste, former resident director or HBS also saw the positive change in Pakistan he noticed, where citizens are taking charge of improving their environment. He also encouraged the journalists to turn to HBS for research support so that together with the civil society and media could make this country and the globe a better place. He did, however, caution about the worrying trend of casting aspersions on the organisations like HBS which have been investing in civil society and policymakers for informed decision making. He lamented the shrinking of space for alternative voices. The guest of honor, Romina Khursheed Alam, former parliamentary secretary on climate change said that she has been running a Green Parliamentarians Caucus in her tenure as Parliamentary Secretary on Climate change in the previous government. In this regard, she applauded the efforts of HBS in supporting her initiative and also their contribution in bridging the knowledge gap through research and dialogues. She also urged cooperate sector to come forward and invest in youth for environmental sustainability through Corporate Social Responsibility funds. She spoke about the reduction in plastic pollution which is much needed. During her tenure, she was able to press on the issue in the parliament floor. A total of 65 anchorpersons and media representatives have presented medallions for their outstanding reporting on the environment. Journalists at the event thanked the capacity building and sensitisation this project offered them and committed to continue reporting on environmental issues as it is a topic that is of consequence and value to all humans and life on the planet.